Operation Wallowa | How Goes the Battle? LZ ROSS–For seven and a half months, SP4 Grady Gregory carried a machine gun for the 1st Air Cavalry Division‘s Third Brigade. Gregory grew attached to his machine gun when, a couple of months after he arrived, his company was ambushed in the mountains near Dak To and fought a fierce battle with well concealed enemy troops. Gregory has worked with Company B. 2nd Battalion, 12th Cavalry around Dak To and in the mountains near Kontum, on the Cambodian border. He worked in the Bong Son area of central Binh Dinh province, where the 1st Air Cavalry has been waging a grinding battle against enemy resistance for more than a year. 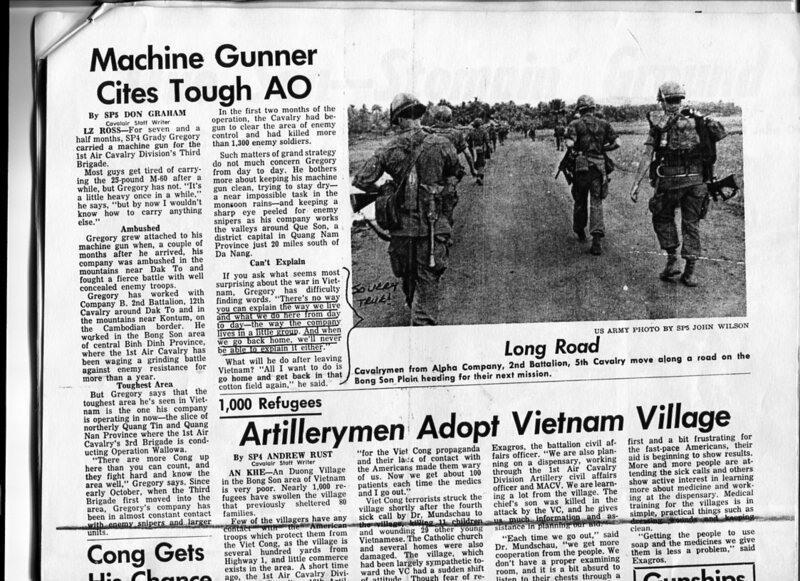 But Gregory says that the toughest area he’s seen in Vietnam is the one his company is operating in now–the slice of northerly Quang Tin and Quang Nan Province where the 1st Air Cavalry’s 3rd Brigade is conducting Operation Wallowa. “There are more Cong up here than you can count, and they fight hard and know the area well,” Gregory says. Since early October, when the Third Brigade first moved into the area, Gregory’s company has been in almost constant contact with enemy snipers and larger units. In the first two months of the operation, the Cavalry had begun to clear the area of enemy control and had killed more than 1,300 enemy soldiers. Such matters of grand strategy do not much concern Gregory from day to day. He bothers more about keeping his machine gun clean, trying to stay dry–a near impossible task in the monsoon rains–and keeping a sharp eye peeled for enemy snipers as his company works the valleys around Que Son, a district capital in Quang Nam Province just 20 miles south of Da Nang. What will he do after leaving Vietnam? “All I want to do is go home and get back in that cotton field again,” he said. Posted by howgoesthebattle in Vietnam War and the G.I. Hey You! Yes; you know who you are. Please don't do it. Do not commit suicide - things will get better - there is help for you - 1-800-273-8255. VA privatization is getting more attention in Congress. My dad said something insightful; He said that if they privatize the VA, it would make it a lot easier to slowly erode veterans healthcare in the name of saving $ so we should do anything we can to protect VA funding. I must admit, I agree.